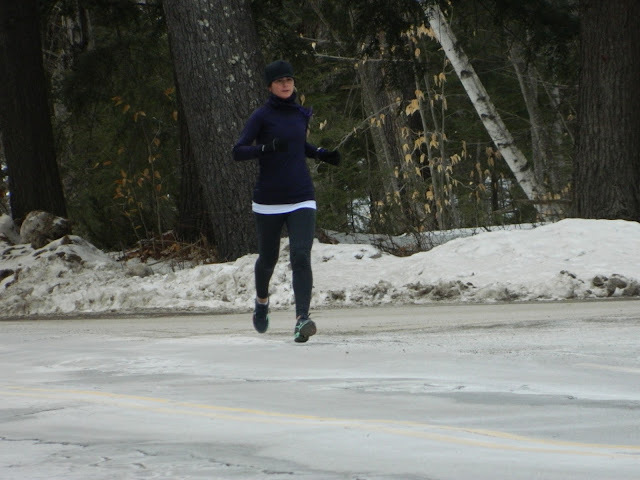 After running my way through more than one winter in New Hampshire, I considered myself a Winter Warrior. It took some practice though. I had to learn how to embrace the frigid temps, wicked winds and foot after foot of snow. There were actually piles of snow everywhere on my last run before we moved to China. Eventually I could layer up with all my favorite gear (like Polartec tights - affiliate) and run in the middle of a snow storm if I wanted to. My idea of cold has changed a lot in the last 2 1/2 years. Cold for me now is anything under 60F degrees, ha! At it's coldest, the temperatures in Hong Kong can dip between 30F and 40F but they don't stay there very long. No matter what your cold feels like, I think it's important to think about how to stay warm. 1. Long sleeve tee or capris - when the temperature drops, the first thing I change is my running outfit. My first go-to change is to try a long sleeve tee with shorts because once I get used to running in shorts I don't want to give them up. If it's too cold for the shorts, I'll dig out my running capris. 2. A hat - I usually hate wearing hats, but they really do work for keeping warm. Since I don't have to worry about my ears freezing, I can usually throw on any old ball cap to do the trick. 3. Heavy duty layers - on the rare really cold day (like my recent feels like 47F 5K), I pull out the winter training gear and layer up. This year I have a new favorite warm top (affiliate) from Athleta. I actually have a ton of gear in storage in Massachusetts, but I didn't think I would need any of it here. 4. Arm warmers/compression socks - sometimes it's only feeling chilly at the beginning of the workout and that's when arm warmers come in handy because you can roll them down once you warm up. Compression socks are great for those in-between shorts and capris temps (or for those of us hanging onto our shorts a little longer). I actually don't remember to wear either of these often enough. 5. The treadmill - when all else fails and I reach my cold weather tolerance limit, there is always the trusty treadmill at the fitness center. I'm pretty sure that only a cold wintery rainy day will force me to run indoors while I'm living here. How do you stay warm on cold weather runs/days where you live? That Hong Kong cold sounds like my kind of winter! Yes, I'm enjoying it while I can - even though my tolerance is changing! Those sure sound like perfect running temps for winter! It's all relative huh?! It really is perfect running weather for me, even though these temperatures feel colder to me now than when I lived in NH. You are right, being cold is relative! Before I started running, I would never want to be outside if I thought it was cold. Now days, 30-40 degrees doesn't bother me one bit! Thankfully we don't usually get colder than that, except for last week! Hong Kong winters sound better than New hampshire winters for sure! Will you stay in Hong Kong permanently or do you plan to move back to NH some day? We will be back to the US someday...and then I will have to get used to the really cold temps again! I plan to enjoy HK winters as much as I can because the summers are wicked HOT! I'm such a wuss when it comes to cold weather running! I have a treadmill so I'll jump on it instead. Usually though I feel better when I get outside, even with the cold! Fresh air, even when it's freezing, is nice! I'm a huge fan of the treadmill when it is super hot here, so I totally get having to use it when it is super cold there. When I lived in NYC, I thought anything over 40 was warm and it didn't really get cold until under 20. Now that I'm in Texas, anything under 60 feels freezing - just like for you haha. I'm such a wuss now when it comes to cold weather. I don't have access to a treadmill, though so I try to brave it with all the layers. Yes, that's me exactly. I never believed that my tolerance for cold/heat would change so quickly, but it has. Although I still feel like I'll melt in the heat and humidity here. I really like arm sleeves and compression socks for those in between temps. Although I think my "in between" temps are your "really cold" temps! I had a great pair of thermo gloves from Mizuno that I loved, but I'm the opposite, haha. I don't need gloves on for very long!